Oreck Cordless Vacuum Review – What Is POD Technology? What Exactly Is POD Technology? The biggest feature that sets this lightweight vacuum cleaner apart from the competition is what Oreck calls their Self Sealing POD™ technology. The POD is a small chamber that is designed to completely trap dirt and tiny dust particles inside, and keep them there until you need to empty it. It is similar to a dust collection bag but holds much more debris and typically lasts much longer. The POD actually starts out small and compact but expands as you are vacuuming. Once it has reached capacity you simply take it out and replace it with another one. There is almost no way the dust can escape during the replacement process, which is something that plagues other similar vacuums that are bagless. Ease Of Use – Simply drop a new (inexpensive) replacement in when the LED indicator tells you it’s time. Long Lasting – Oreck testing showed that it can last as much as a month or more of typical household cleaning depending on the size of your home and type of dirt it picks up. Mess Free Disposal – Just pull the POD out and drop it in the garbage once it is full. No reason to get dirt particles on your skin or have dust settle on the outside of the vacuum like on similar bagless competitors. Small To Start – These PODs start out small but expand inside the vacuum as dirt gets picked up. They don’t take up much space when stored before use but are still able to hold more than similar sized bags. Cheap Replacements – The vacuum comes with a pack of 5 replacement PODs and you can purchase 5 more when needed for under $20. These could last as long as 6 months. The batteries in today’s cordless vacuums have improved tremendously in recent years. The lithium ion generation greatly surpasses prior generations in terms of length of use and power output. The power is drained in a fade-free manner so you don’t experience any diminishing of suction until the battery is emptied. This is far different than cordless cleaners of a few years ago that would slowly lose power over time. This was much worse because the machine would be virtually unusable when the battery was only half drained. Lithium ion batteries are much improved in this area. 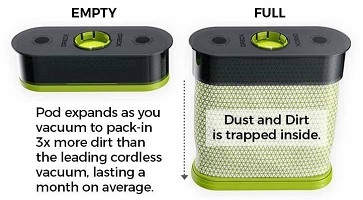 The battery in the Oreck POD has been tested to last around 35 minutes which is comparable to other brands, though the Dyson V10 is rated to last longer. You should be able to clean a normal sized home in that time, especially since the POD is built for smooth floors and low pile carpeting. These surfaces don’t drain the battery as much as a high pile carpet would. You can also charge the battery back to full in about 2.5 hours so just remember to leave it charging when not in use so it is ready to go when you are. Click here to visit our favorite eCommerce site for pricing and availability! InVision Intelligence Built In – What Is That? Oreck’s InVision Intelligence™ is mounted right on the top of the vacuum and it provides information into the current state of the vacuum. It will show you how much charge the battery still has, how full the POD is, and what power setting you are operating on. This is important as you can keep vacuuming even when you need to check on these settings. You don’t have to stop to look at the collection bin like on some other bagless vacuums. Oreck designed the POD to be user friendly, even by lightweight stick standards. AirPower Pivoting Brushroll Tool – This works on pet hair and other items that are hard to remove from furniture and other surfaces. Soft Bristle Dust Tool – This is a good attachment for loose debris in tough to reach places or high crevices and corners. Wide Path Crevice Tool – Works well on tight corners and between cushions on the furniture. Wall Mount Charger – Comes with a plug so you can keep the POD fully charged and ready to go when not in use. 5 POD Refills – This will give you enough PODs to last around 6 months or so. Tool Rack – This holds the vacuum cleaner as well as the extra tools so they are always within reach when you need them. 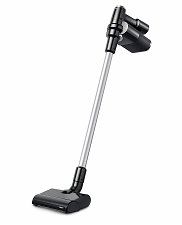 The Oreck POD is definitely a major player in the lightweight cordless vacuum category. It has everything you would want from a lightweight machine, and it can even operate in handheld mode. This means you have portable cleaning ability for all areas of your home, and even in your car if needed. Oreck is known for high quality and great filtration, which they have incorporated into the POD. For more information on it including current pricing and online consumer reviews, click here to visit our recommended supplier.